I’m on Day 2 of my 5 day vacation and am totally loving life right now. I had a great day yesterday with a couple of long walks, a fun workout with a new friend, a big Thai feast with my man, and the night ended with a 90-minute flow yoga session on one of the busiest corners of downtown Vancouver. I love that feeling of connectedness I get when I do a yoga class. I purchased a membership to an online yoga video subscription a couple of months ago which is great for the body, but it just doesn’t have the same energy. I plan to soak in as much good vibes as I can these next two days! This time tomorrow I will be running my fourth half marathon, the Seawheeze Half hosted by Lululemon. Today and tomorrow are going to be filled with with lots of yoga, running, sweating, friends, and eating. While I’ve had mixed thoughts about the run itself this year, I’ve been looking forward to this weekend ever since I made it through the stressful registration process. The site crashed when registration opened the first time so we had to wait TWO WEEKS for them to re-do the process, which involved getting into an online waiting room before finding out if your registration was accepted or not. The race sold out in under an hour, but fortunately my friends and I all made it in. 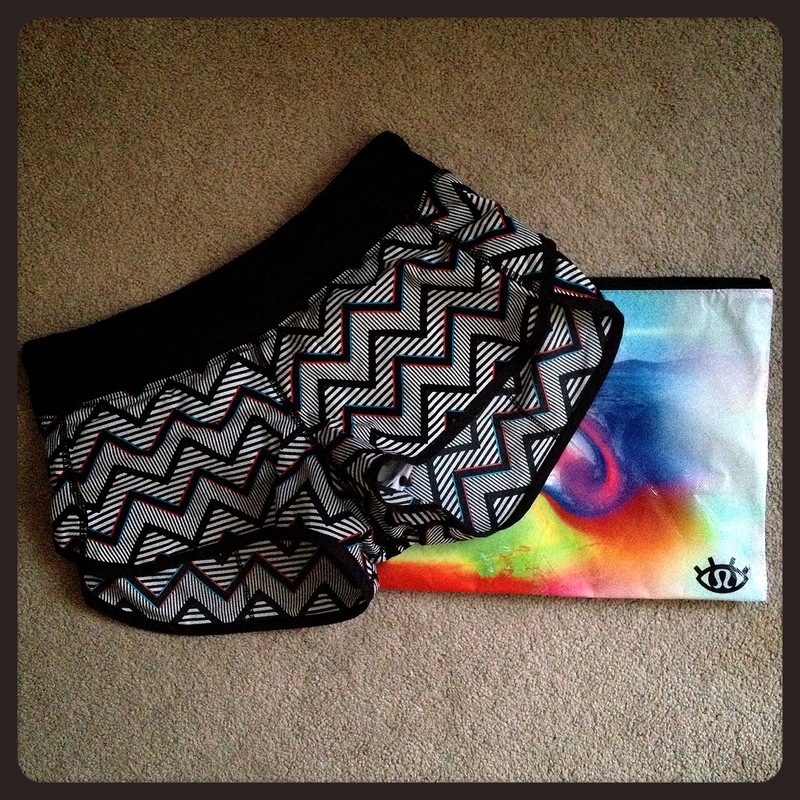 I got my cute 3D shorts early May and have been running in them since. A couple weeks ago an old dude with long grey hair and a big happy face on his shirt told me they were “rad”. I definitely agree. I can’t wait to see what other limited edition Lulu swag I can pick up at the race expo today. I’ll share all my goodies next week! After what’s probably going to be a couple hour wait at package pick-up and wandering around the expo with one friend, I plan on taking it easy before heading for Sunset Yoga with another friend, after which point I will stuff my face with steak and carbs and then hit the hay. The fun doesn’t end after the run, either! There’s a large group of us going for a post-race feast and an outdoor concert and huge outdoor yoga session held in Stanley Park later tomorrow evening. My IT band left me so crippled after last year’s Seawheeze that I could barely bend for some of the yoga poses, but I’m much more optimistic about things this year. The friends I’m running with are aiming for a sub 2:30 time, which in theory should be possible for me, but I’m planning on taking it as slow as I need to keep this thing from flaring up. My 20km run last week averaged about 11:47 minutes per mile, so with subtracting traffic from the equation I should hopefully be able to keep up. Full recap next week! 2. If you’re more into the yoga side of Seawheeze, as I mentioned above, there’s a huge after-party being held at Stanley Park. This year anyone can attend the Sunset Festival! 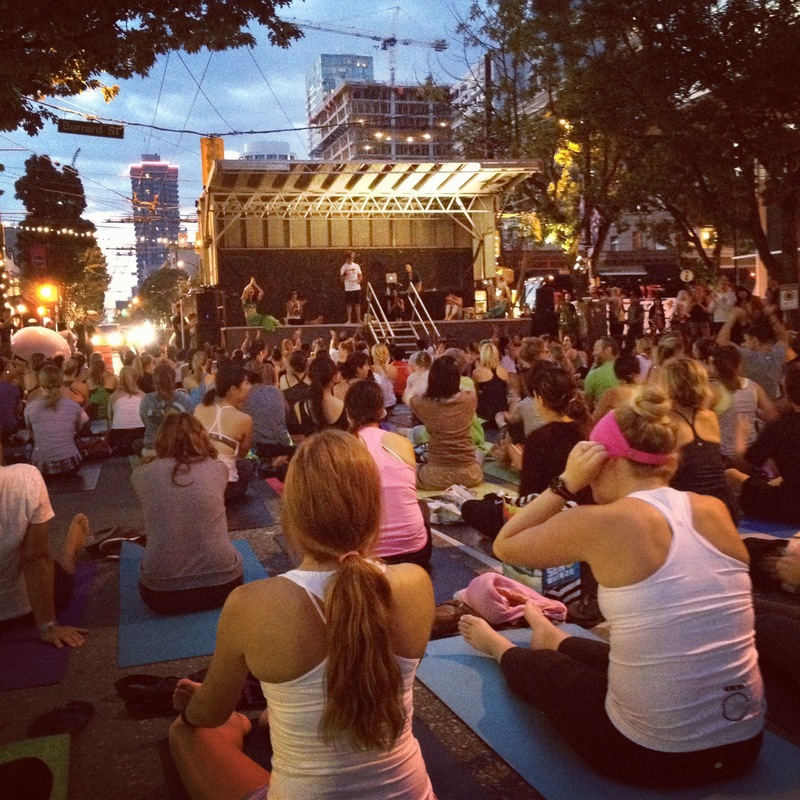 At 6pm Vancouver’s biggest outdoor yoga class will begin, hosted by Eoin Finn. Doesn’t his name just scream “yogi”? Apparently he excels in “blissology”, the art of tuning into the connective force between ourselves and nature. He taught last night’s session and was so funny. I can’t wait to see what he has in store for Saturday. 3. If you want to take your sweatiness out to sea, go out for a kayak! I absolutely love kayaking, and living so close to the water there’s a ton of different places to choose from. You can rent from Creekside Kayaks, EcoMarine at English Bay and Jericho Beach, plus dozens of other locations around the Lower Mainland. Want to kayak for a cause? Participate in Kayak for a Cure to raise money for the Canadian Cancer Society on Saturday, or paddle with Inspire Health on Sunday to support integrative cancer care and shine the light on health and wellness. Both of these events are for all levels of paddlers. 5. Feeling a little more competitive with your water adventures? Take part in Club Locarno’s Annual Coastal Adventure Regatta. Rowers, kayakers, SUPers, and canoe-ers will race a 5km, 10km, or 25km distance with first prizes valuing at about $500. Entry is $15 and there’s a beer garden and BBQ for land dwellers. 6. Water not your thing? That’s cool, there’s tons you can do on dry land as well. 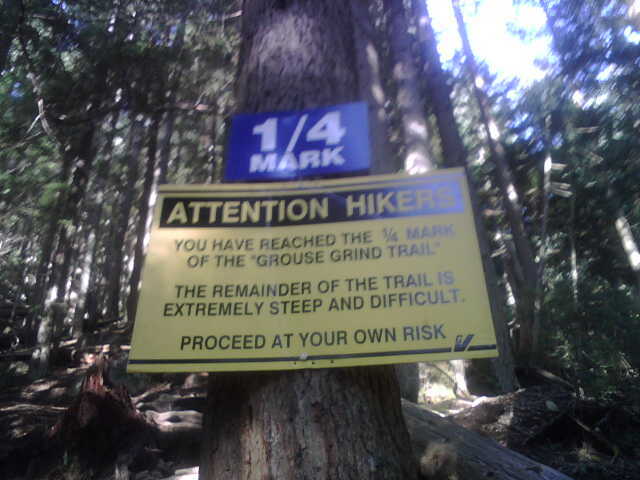 Like my favourite, The Grouse Grind. A 2.9km ascent up 2800 stairs leading up the side of a mountain, The Grind is not for the faint of heart. While totally doable (I’ve seen both small children and men old enough to be my grandpa during my trips up), The Grind can be very taxing on the cardiovascular system and the legs. As with any physical activity, be mindful of any injuries you have that may be aggravated by this. But don’t let that scare you away! If you fuel properly and empty your bladder beforehand (there are no bathrooms along the trail) you can take breaks as often as you need to make it to the top. Just be courteous of others and step to the side 🙂 The average time to complete The Grind is about 90 minutes. My shortest time is 44 minutes, which I’m determined to beat this summer. Hiking back down The Grind is technically forbidden (however every once in awhile you encounter some jerks who turn around at the top and head back down), so the cost is $10 to take the gondola down. The view at the top is totally worth it. 7. If you’d like a little more leisurely stroll through the beauty of North Vancouver head to Lynn Canyon and hike along one of the many trails Mother Nature has to offer. There are trails for all levels so do some research, pick your poison, pack some healthy snacks (including lots of healthy fats!) and head out for the day. 8. If hiking through the mountains doesn’t seem like fun to you, maybe cycling 50 or 100km out to the valley and back does! The MEC Vancouver Summer Century Ride on Sunday leads cyclists on a scenic tour of the Lower Mainland for $35. Enter to win some great prizes, eat some free food, and get to know your suburbs, all while getting EXTRA sweaty. 10. And finally, if being outdoors just isn’t your thing, you should probably go read another blog because I don’t think we could ever be friends. JOKING. Kind of. But really. If you’d rather sweat indoors without going to a gym, check out an indoor climbing or bouldering center! Last year I went to The Hive and had a GREAT time. Both climbing and bouldering offer a fantastic upper body challenge, I really enjoyed the thrill of not being connected to ropes or anything with bouldering. If you’d prefer a little more security, check out Cliffhanger for indoor climbing. And that’s all I’ve got for ya! Check back next week for my full recap of Seawheeze and all the festivities that accompany it. And wish me luck…on Monday I’ll be writing my exam to become a certified Canfitpro Nutrition and Weight Loss Specialist! What does that mean? Basically it’s just another fancy title to continue doing all the things I’ve already been doing. But a title’s a title, right? So tell me friends, how do you plan on getting sweaty this weekend? Are any of you wonderful people running Seawheeze? This entry was posted in Fitness and tagged diet, exercise, fitness, half marathon, health, healthy-living, seawheeze, sweat pink, wellness. Bookmark the permalink. « Review of Lancome’s New Grandiose Mascara…Does it Pass the Sweat Test? Enjoy the Seawheeze! A friend did is last year, but fell victim to the registration crash this year. Great list of cool stuff to do while in Van!! Yaaay! Good luck! I have a few friends from here in Texas that flew up for the race. Go get it! I love Vancouver! Check out the Lynn Canyon Suspension Bridge if you can. Awesome!! It was a lot of fun thanks. IT band crapped out on me but I’m not letting it get me down 😉 I’ve lived downtown for almost two years and when I’m working at the hotel I always recommend guests go to Lynn Canyon bridge instead of Capilano, but I have yet to go myself! I’ll definitely have to one of these days. Loving those shorts – so much better than last years! I think I’m going to make Seawheeze my half next summer. GOOD LUCK!